Is The Invisible Scar a professional organization? No. It’s not a professional organization nor run by mental-health professionals. The Invisible Scar is a Catholic-run website focusing on sharing information about the prevention and awareness of emotional child abuse, its effects on adult survivors, ACONs (adult children of narcissists), and the power of words. This website is meant to be a springboard for readers who’ve endured (or are enduring) emotional child abuse to realize that emotional abuse is not normal or acceptable, and to seek professional help. Veronica Jarski is the founder of The Invisible Scar. She has extensive editorial experience and a bachelor’s degree in journalism. Her work has been featured on myriad publications, such as Kapost, Loyola Press, MarketingProfs, Ragan, and many more. She currently creates content for a wireless technologies company. The Invisible Scar is her passion project. Why was The Invisible Scar started? When? The Invisible Scar was created out of a desire to share current research, findings, information, and stories regarding emotional child abuse as well as to shed light on its effects on adult survivors. The Invisible Scar was launched on April 9, 2013 for Child Abuse Awareness and Prevention month. Why do you focus on adults? The focus of the site at the very beginning was just children. After the first few posts, however, and many emails, I realized that readers mostly were adult survivors of emotional child abuse. And so, adult survivors of emotional child abuse have become the focus of The Invisible Scar. I often address adults because most emotionally abused children will not actively seek help until they are adults aware that they have suffered emotional abuse in their childhood. Why do you write about the narcissistic personality disorder? ACoNs (adult children of narcissists) do not have enough support or understanding about the intensely lonely, grueling, and exhausting experience about being an ACoN. Not enough attention is given to ACoNs and the term “narcissist” is used much too lightly to mean “vanity.” A true narcissist is real and abusive. Note: Though the Invisible Scar has a subsection dedicated to this personality disorder, I do not think all emotional abusers have NPD. Though all people with NPD are emotional abusers, not all emotional abusers have NPD. In fact, some parents can change and learn how to better parent their children. However, people with NPD never change. Do you have parents with NPD? 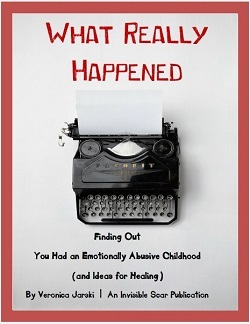 Were you emotionally abused as a child? This website is geared to help people on their own journeys and seek professional help to guide them towards healing; it is not my personal blog. You will not find people’s personal stories or experiences on this blog except in the moderated comments. Again, the focus is on sharing information. Your replies to comments and blog posts make me feel like I know your story. Will you share it? I’m glad you feel a connection to The Invisible Scar. In terms of sharing our personal stories, The Invisible Scar is not my personal blog. The emphasis here is on you, the reader, not on me. Can I share my personal story? Absolutely! Feel free to use the comments section to engage in a conversation about emotional child abuse. Comments are moderated, though. Triggering language, abusive talk, spamming, or bashing, etc., will not be published. Can I send you my poem/novel/short story/photograph/creative work/memoir? The Invisible Scar does not accept submissions (e.g., essays, poems, photographs, guest posts, etc.). Please do not send any written pieces or creative work, for it will not be read or opened. This is due to professional obligations and legal concerns. Why do you advocate therapy? I believe that prayer alone, meds alone, etc. can help me heal. A neutral third-party who understands emotional child abuse can do wonders that even the most caring friend cannot. I encourage prayer, too, and believe that, if necessary, meds can help deal with depression. However, I strongly suggest that people who have been emotionally abused understand that a toolbox is needed for healing. I don’t think God’s power has a limit, but I believe that God provides many tools for healing, including therapy. Why did you just mention God? I don’t think you should mention God or religion in this site. Religion causes emotional abuse. People, exercising their free will, cause emotional abuse. Not God. The Invisible Scar is a Catholic lay ministry, loyal to the Magisterium, and so I create content from a Catholic worldview. If I were to censor our articles to exclude references to the Catholic faith or Christianity or God, I would be catering to a non-Catholic group—which would be illogical as I consider The Invisible Scar to be a Catholic ministry. Also, if I catered to non-Christians, I’d offend Christians. Or we’d risk offending this group or that one. So, rather than censoring my articles, I am exercising my freedom of the press and stating clearly that this site maintains a Catholic perspective. If you find that you’d rather not read something that refers to Christianity or prayer, you can do a Google search for a better-suited resource site or check out Psychology Today or Psych Central, two secular sources I often refer to. I have just realized that I was an emotionally abused child and am trying to cope. What should I do? Please check out this section. I feel so alone. No one understands what I am going through. None of my friends or family members believes me. How can I deal with this? Myriad adult children of emotional child abuse have survived. They’ve unearthed the truth of their childhood, mourned what was, focused on the present, and moved forward to an emotionally healthier life. The path can seem lonely. But you are not alone. Why do you advocate that adult children go no-contact with their parents? I advocate that adult children do (legally, of course) what is best for their own healing. That always means a break from their parents, though whether the break should be permanent only the adult child can decide. An adult child has been conditioned to accept abuse, to let abusive parents run right over any boundaries, to be compliant to the abuser. Separation is crucial at the beginning, so that the adult survivor can have some quiet and peace and thinking space. An adult survivor needs time and distance to reflect on all that has happened, to seek therapy to cope with what was and to learn skills for what is and what can be. An adult survivor needs to learn to establish healthy boundaries and regain control over his or her own life. None of that is possible with an abusive parent hovering around, squawking orders, making demands, and fighting to put the adult child back into the preferred role of subordinate. An adult survivor needs to heal at his or her own pace as well. No Contact means the adult survivor doesn’t have an abusive parent giving the child a time table or ultimatums regarding when therapy should end or when everyone should be back into the parent-assigned roles. I do believe that, in some situations, the adult children must go no contact with their parents if their parents have not shown remorse and a true change of behavior for an extended period of time. No one should be allowed to emotionally abuse another being, and no one should be forced to endure it. Do you respond to every comment here? I try! I really, really try. And because of the deep emotional nature of the comments, I often just wish I could extend a hug to everyone and let readers know that I care. Know that The Invisible Scar has a prayer group dedicated to praying for adult survivors of emotional child abuse. I can’t even describe the immense gratitude that I have for you creating this. I’m just now trying to figure out how to heal from my childhood and this is the first time I’ve ever seen such a positive outlook that the cycle can be broken. Is there a way to find a counselor that specializes in this or someone that helps with emotional abuse specifically? For years I’ve known that something was wrong with me and my mother’s relationship, but until now I’ve been totally averse to labelling it as abuse, but after finding this today a huge weight has been lifted off my shoulders. I have spent most of today crying, both because of a sense of relief and realisation that what happened to me was not normal and that none of it was my fault. I now as an adult suffer from severe anxiety and depression, which I now blame solely on the emotional abuse inflicted on me as a child. Unfortunately my younger sister still lives at home, and is still fully under my mother’s manipulating thumb and tells her everything, but I know that her mental health also suffers in the same way mines does. I want to reach out to her and want her to realise too that she is being emotionally abused, but I’m not sure how I can do that without risking her reacting badly (i.e denying the abuse and standing up for my mother) and telling my mum that I’m implying she’s abusive. I would outright cut contact with my mum but if I did that I would lose all contact with my grandmother whom I adore. I don’t know what to do now. I am an abuse survivor. I was not the child, I was the wife. Two husbands. My son, my youngest caught the worst. his heart broken many times. I left, took both my kids and left. Sadly the state continued to require he see his Father. Professional courtesy, you know for Firefighters and all. My son is 22, his heart is broken, he is such a passionate kid, he has NEVER abused anyone, he is an underdog for all the little guys. His scars though run deep. I need help helping him, Support groups, I want to hug him until he heals. I want to give him hope and all that goes with it. I am sitting at work, crying as I type this. 25 years on Nights in the ER, you’d think my heart would be a little tougher. I just want to see him smile, to believe in that one thing possible out of things possible. Please any advice will be appreciated. thank you. Just this week I buried my mother, I chose not to be part of the funeral arrangements as I did not feel I could offer anything nor was it the right thing to do. My brother and sister have not spoken to me since. It seems as if everytime i stand up for myself in regard to my mother i am punished in some form. For as long as I remember my mother told me I was a bad baby a bad child a bad teen a bad adult a bad mother. She picked on me continuesly as a child and i was always walking on egg shells, don’t get me wrong we did have some nice times. However for me this continued on into adulthood, where she tried to have my children removed from me after I experienced a severe depressive episode or rather did this while I was in hospital. She tried to convince my then partner whom is now my husband to leave me. There is so much more to write. What i do know is I have two beautiful incredibly well adjusted teeangers, a wonderful husband amazing friends a job I love as a health professional but why do I feel “stuck” and full of guilt and why me?? I really rely on this website. I don’t visit it as often as I used to, when I first realized that my mother is a Narcissist. This website has kept me afloat. Many Thxs! I do revisit many of your articles. They strengthen me when I doubt myself. I’m visiting again, Mother’s Day is looming. I tried to comment on one of your other articles about your misfortune of losing your job. Now I get the chance to offer you (Veronica) support. I was an Automotive Designer. I loved my job and worked many hours. Then 911 hit and the NY towers fell. This hit the Automotive Industry hard. I was laid off 3 different times. But I picked myself up, started home business and learned to live with less. I came to realize that 1/3 of the money I was spending was a waste. Now that I work at home I have my own hours, I’m the boss, the accountant and Purchaser. I have a new passion of Estate sales. Oh the things you find, it’s like your birthday. My Narc mother did not emotionally support me, nor help me through this change in my life. She said “Well if you stay home with yourself, you will drive yourself crazy!” How wrong she was. Veronica, your are a talented writer. Stay strong and let your strengths and passions lead you. It will all wok out in the wash…I just realized the this probably too to late to help? There’s a little irony in the fact that you were an automobile designer in that was what I wanted to be with all my soul from seven years old until my late teens. Don’t need to tell any of you that when you reveal what you truly love to a narcissist what do they do? Took a while but eventually went no contact. She died with two people at her funeral. Both in her will. I still draw stuff I see on Hemmings Motor News. Makes me half smile and half cry. Hi Veronica! So grateful for your work here. Thank you. I’ve just begun a new blog and I absolutely want to share your articles—however, I am so new at blogging—I’m not sure how to yet! Soon….